San Antonio was a wide-open gambling town, and Lottie was soon hired as a dealer at Frank Thurmond’s University Club, receiving a percentage of the winnings. Cowboys lined up, hats in hand, for the privilege of playing the pretty lady. Lottie fell in love with part-Cherokee boss Frank Thurmond and remained loyal to him, dumping her other admirers. During a poker game, Frank and another player got into a fight. Frank killed the man with his Bowie knife which he kept on a string down his back and could easily access just by reaching down his shirt collar. The man’s family put a bounty on Frank, who was forced to leave town. 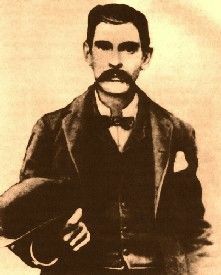 It is thought that Frank later taught the Bowie knife hiding place to his friend, Doc Holliday. Soon Lottie followed looking for him, gambling her way around West Texas in Fort Concho (where she was called “Mystic Maude”), San Angelo, Denison, Fort Worth and Jacksboro, eventually finding Frank working at the Bee Hive in Fort Griffin. Lottie got a job there dealing cards and it was here that she was introduced to Frank’s friend, Doc Holliday, who soon became an admiring customer at Lottie’s faro table. On one well-recorded occasion, Doc lost $3,000 to the lady. Good whiskey makes us funny. And taste the flavor of our honey. Legend has it that, during a faro game at the Bee Hive, Doc and Lottie were in the middle of a game when Big Nose Kate Elder, Doc’s girlfriend, arrived in a jealous rage. An argument ensued in which both women drew their guns, ready to fire. DDoc had to step in and stop the fight. Bearing in mind Lottie’s reputation as an elegant lady, and the fact that stories tend to get ever juicier when told by many people over a long period of time, this may not be historically accurate, no matter what the historians say. But one thing is probable — the two women had serious words over Doc. At Fort Griffin, Johnny Golden, the jockey-gambler, came back into Lottie’s life—but not for long. Although he found his former sweetheart dealing cards at the Bee Hive, next day, he was shot dead on the street behind the saloon. Lottie paid for his burial suit plus $65.00 for a coffin but did not attend the funeral. Rather she sat in her house with the curtains drawn. In several versions of the story, the money on the table that night disappeared and most witnesses believed it ended up in Lottie’s purse. It was said of Lottie that she had class and refinement. A lifelong friend told an interviewer many years later that she “was a fine looker… in manners a typical Southern Lady. She had nothing to do with the common prostitutes… she was not a ‘gold digger’.” Lottie “stood apart from the rabble”. After five years, Lottie and Frank left Texas for New Mexico where they finally married. Not long after, Frank for the second time used his Bowie knife to terminate a man. It was self-defense, but it was the turning point for Frank and Lottie. They swore off gambling and settled down in Deming. Frank succeeded in mining and real estate, eventually becoming vice president of the Deming National Bank. Lottie, under her married name Charlotte Thurmond, became a well-respected member of the community. Although she quit dealing, according to legend, in 1892 the original structure of St. Luke’s frontier church was financed by $40,000 of winnings from a poker game with Doc Holliday in attendance and hosted by Lottie Deno. And, for a fact, Lottie Deno made one of the altar cloths used by St. Luke’s. Respectability was at last hers. 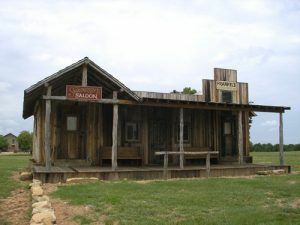 Epilogue: The character immortalized as the beautiful, redheaded Miss Kitty who ran the Longbranch Saloon in the famous “Gunsmoke” radio and television series, was based on Lottie Deno. About the Author: Maggie Van Ostrand’s articles have appeared in the Chicago Tribune, the Boston Globe, various magazines; monthly in the Mexican publication, El Ojo Del Lago and mexconnect.com, and numerous contributions to Texas Escapes Online Magazine, from which this article was provided.